3 mi. | 700′ ele. gain | 2:30 hr. Planning group outings in the winter is somewhat of a challenge. Each snow season is a little different than the one before and conditions can change day to day, hour to hour. I settled on a quick little snowshoe up Vista Butte with the Cascades Mountaineers today instead of sitting at home and letting a weekend go by. I was joined by 4 other folks who were looking to get out. The pace varied tremendously from person to person so we took the pace of the slowest hiker. 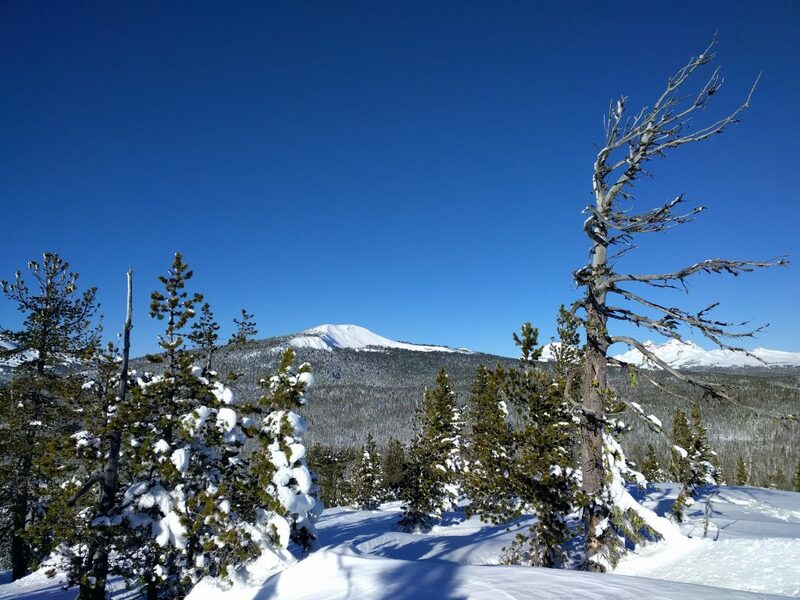 It was a perfect, bluebird day with plenty of fresh snow to plow through. As best as we could, we followed the little blue markers to the top of the butte. We veered off course slightly to make a more direct line. At the top we enjoyed the views that we earned with just a moderate effort. On the way down, we stopped to ask questions about the animal tracks we noticed along the way. There were a couple of experts in the group that shared some knowledge about the type of animals and their possible behaviors. One of the fun parts about hiking in the snow is seeing so much animal sign that you otherwise miss in the summer. The tracks weave a story about what happened in the forest before you arrived. Heading back, we made a much more direct line to the road. Bounding through deep, fresh snow on snowshoes it took no time at all to be within earshot of all the traffic headed up to Mt. Bachelor. We were back to the car before lunchtime. Since I wished that the trip was longer, I decided it was time for me to do some more research about other snowshoe options in the area! This entry was posted in Hiking, Oregon and tagged hike366 on January 15, 2017 by Jess B.